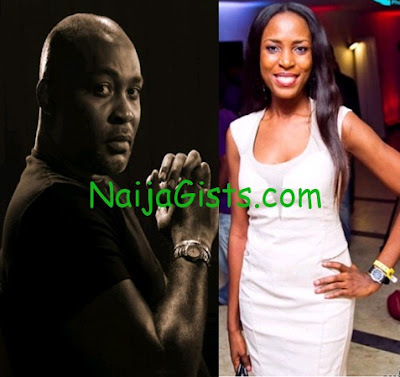 Veteran Nollywood actor and the present Sports Commissioner for Delta State, Mr Richard Mofe Damijo, RMD is currently exploring legal action against celebrity Nigerian blogger Linda Ikeji over a false publication of a 250Million Naira mansion owned by RMD she published on her blog on Friday July 6th, 2012. After receiving alerts from friends and fans, the actor immediately took to twitter to insult and warn Linda Ikeji with the messages below. 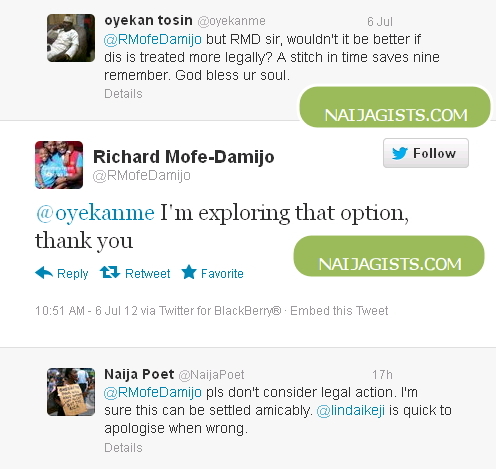 While responding to one of his fans regarding this issue on twitter, RMD said he is currently exploring legal action against Linda Ikeji. A fan of Linda Ikeji quickly begged the actor to ignore legal action that the blogger will apologize soon. Richard Mofe Damijo should have developed a thicker skin than this. Richard Mofe Damijo,RMD Turns 51 Today – Happy Birthday! RMD… Pls don’t mind Linda. She’s found of making much Ado about nothing, with her indictive journalism. maturity is when u c smfn written bou u n u respond maturely 2 it. Its a normal fin 2 c such n d mature fin 2 do is take it calm n treat it with understandn. Routty pause! !She should make a thorough search before publication. Apologizing is medicine after death….Don’t support her a bit.